In the interest of completeness I decided to do a blog post on this dress, which doesn't photograph very well at all but is interesting nonetheless. 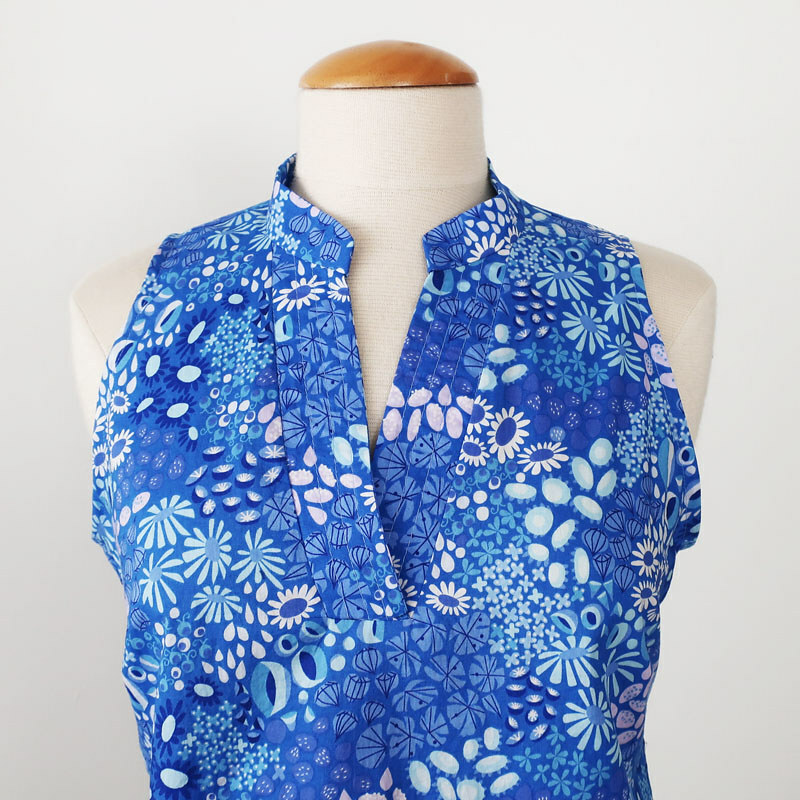 One of our most popular classes at Hello Stitch is the Garment Copy class and I think this might be one of my favorite sewing things, both to do and to teach. 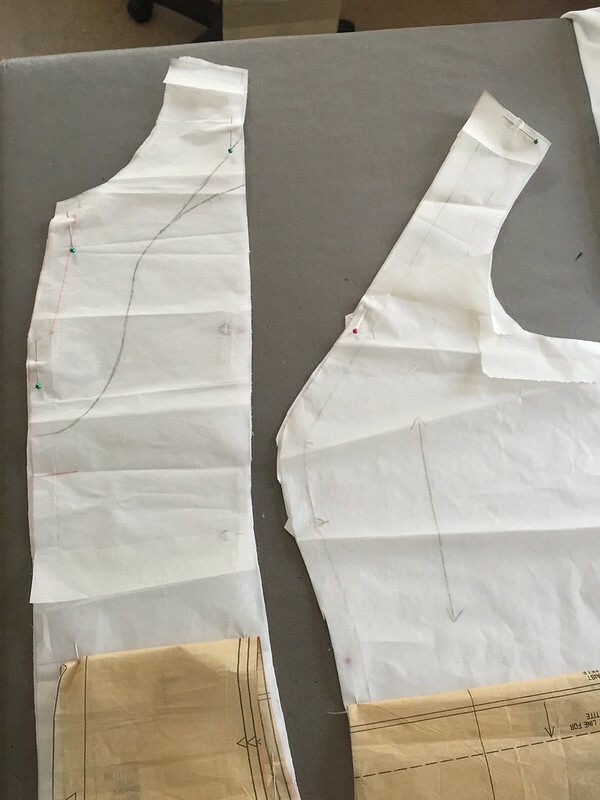 So while on that topic - the upcoming How to Copy a Garment class is next weekend, Sunday Sept. 30, 10am-4pm, and that will be the last one scheduled until the new year. So if you are interested jump on that. Last summer Janice brought me this dress to copy, and I confess I was a bit flummoxed at first. For a simple summer dress it has a lot of details. However I think things that have a lot of pattern pieces are actually easier, since you can just go step by step, copying each one (carefully labeling!) and soon enough it's done. Garments that have large swaths of fabric or are long I find are more difficult to copy, and just to manage on the sewing table. This dress has a lot of narrow princess seam panels, a front and back yoke, pleating, godets, and pleated pockets with a welt opening. I almost hesitate to show you the original dress because it hardly shows off the details but perhaps they are visible. The front neckline has a crossover yoke, and then the center front has both one large box pleat and small tucks on either side of that. The pocket is sewn on a panel so the edges get enclosed in the seaming, and then has a welt opening. If you look closely at the pocket seam on the left, you can maybe make out that there is a godet in that seam as well. In fact in each long princess panel seam there is a godet, all of different sizes. Here are some of the pattern pieces that I made. For this dress I traced each piece, and by measurement added the pleating etc. If you look closely you can see that I add a lot of directions, markings, notes to myself, and particularly dots and notches where things join. Here is my test version of the pattern. 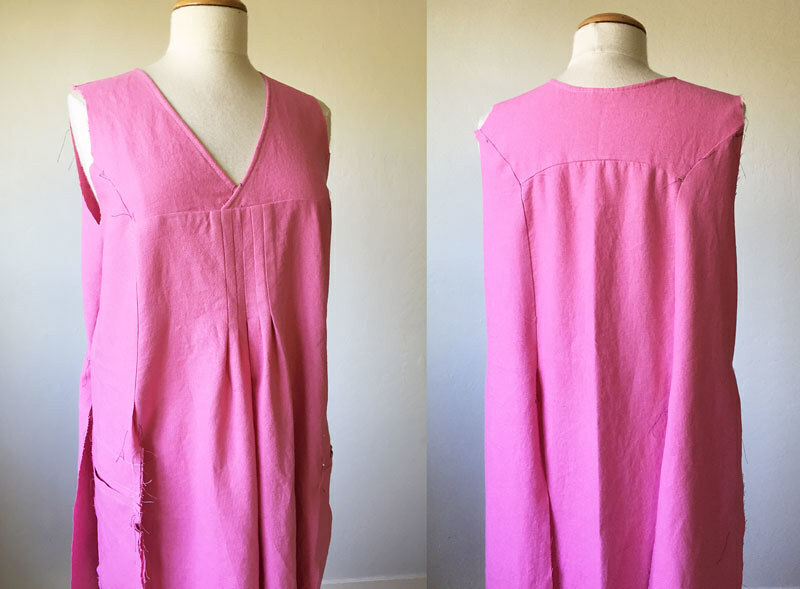 I had some rather scratchy not quite linen fabric that I bought at some sale or other, in an ugly bubble gum pink. 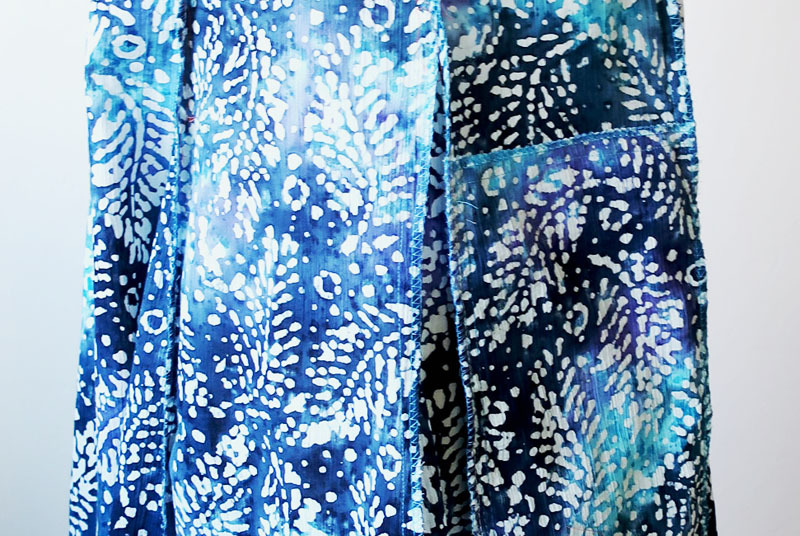 The good thing about this fabric is that you can see the details better than on the original or on the final version I sewed (which is the blue batik print gauze you can see peeking in the photo above). For the test dress I didn't have enough to make the godet inserts but they weren't really necessary, the important things to test here are the front pleats, the yoke and the pocket. But before we continue I have to show a funny goof that I did. Back to the pockets, here is a look at the finished pocket, although the side seams are missing the godets but you can imagine them there. Here is the pocket pattern piece. I've found that the key to making pleated pattern pieces is to fold the pleat into the paper, and then pattern from there, if that makes sense. 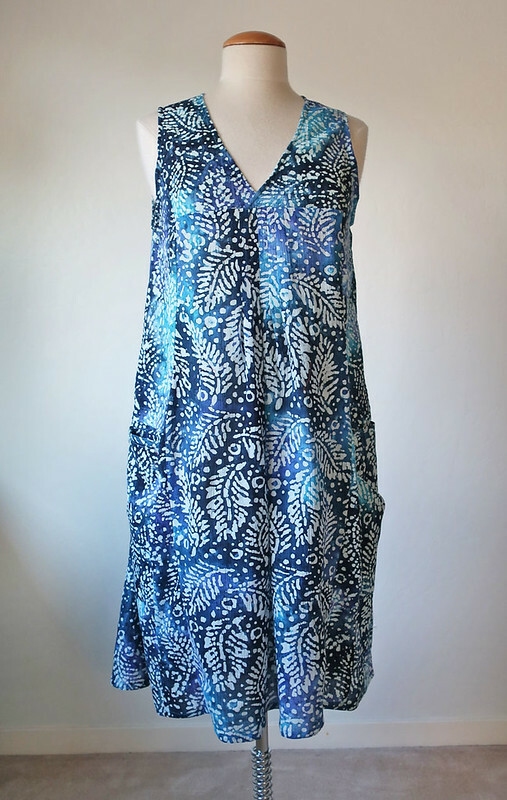 Janice found this cotton gauze print at Joann's and while I love the print and colors and the weight is perfect for this dress the details just disappear 😞. Pictured are two of the godet pieces, one was particularly narrow and also curved a bit. It's really interesting to copy a garment and find details that are unexpected, I learn something every time I do a garment copy. I will mention that since the original was striped that was really helpful to visualize the grain and shape of the pattern pieces which was an unusual bonus. Final version - pretty summer dress and perfect to take on her upcoming holiday in Spain (or at least it was back in July when I took this photo). 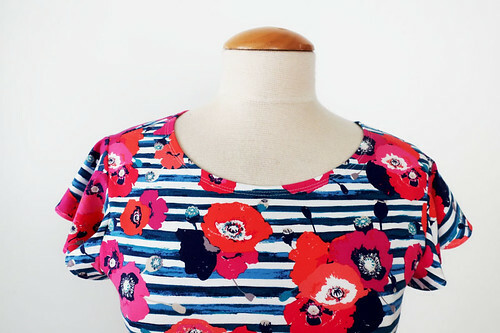 This is a better representation of the colors, and a closer look at the front neckline. A couple of looks at the inside since there you can possibly see the seaming that is not so apparent on the outside. Here are a few other things I've sewn for Janice - she has a deep stash of gorgeous fabrics so it's always a treat to see what she brings me next. Interestingly most all those items are Simplicity patterns - although the blouse is New Look. 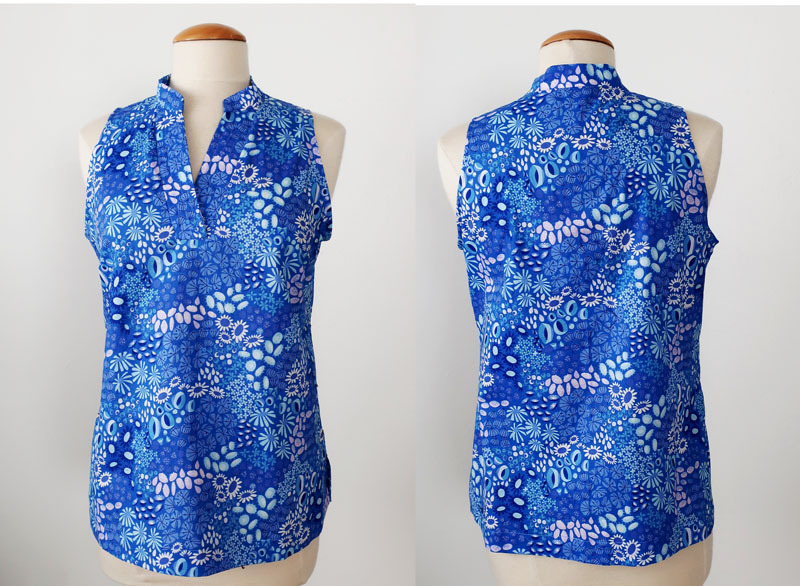 Click on the links for the blog posts with all the pattern and sewing details. I LOVE that tie front blouse and have intentions to make it for myself one of these days. Lots of muslin sewing as I just did a couple of test items for Heather, a blouse, a wrap dress and a blazer. So plenty to do this fall! 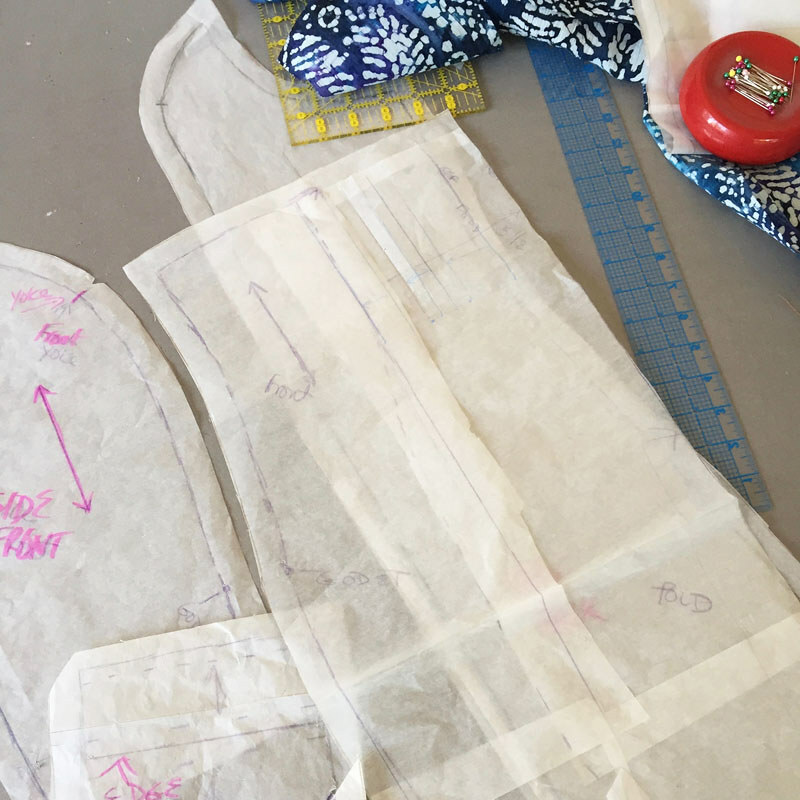 A Pattern Fitting class is coming up on Sunday Oct. 14 - probably the only one until after the holidays as the schedule at Hello Stitch is pretty full. 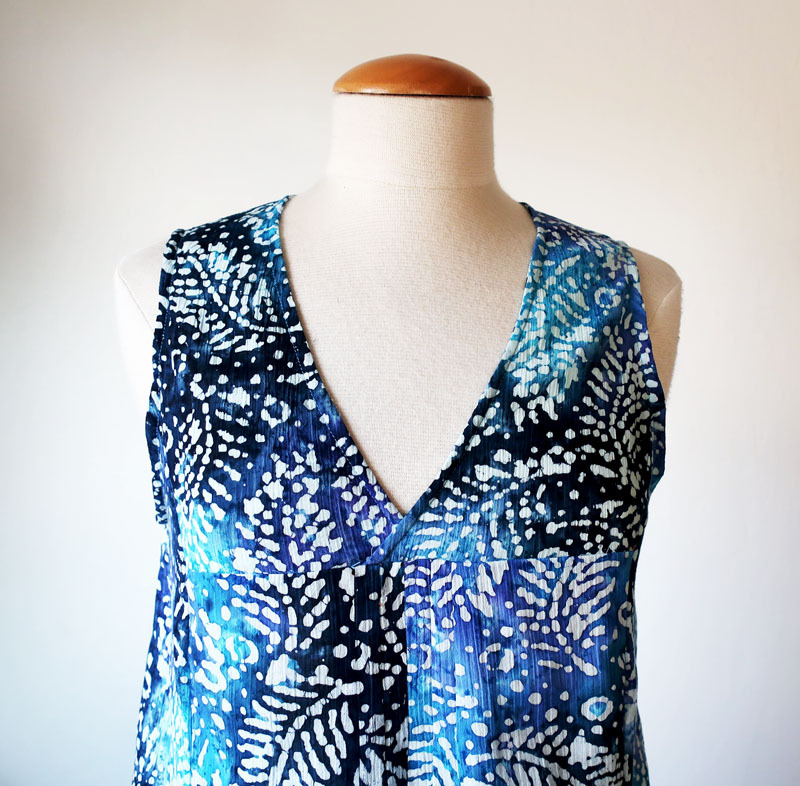 So if you want to fit a pattern for your holiday or winter sewing I hope you can make it. All the Garment Sewing classes at the studio can be found here. This week on Thursday 6-9pm is my "How to read a pattern" Class, which is great for new sewers and anyone getting back into it or just wondering about all the details and info provided (or not provided) on sewing patterns, any and all brands. Plus we talk a lot about measuring yourself and how to choose a pattern size. Important stuff before you cut anything out, right? OK, time for me to get outside for some exercise and to enjoy this lovely California sunshine. The calendar might say it's fall but I will say summer forever. today's garden photo. 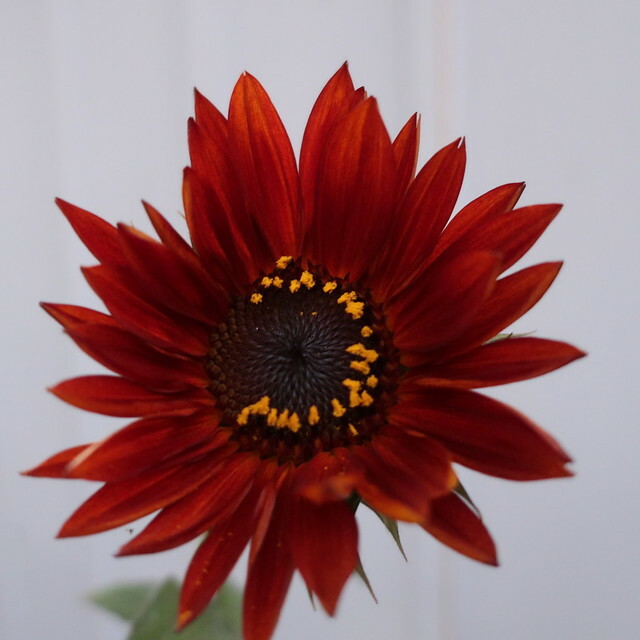 I don't have all that much luck with sunflowers, although I just randomly scatter some seeds and if they pop up in the garden then there they are. But I do love seeing them around. Yesterday the subject for the #sewphotohop in Instagram was Fitting S.O.S. Which is a topic we can all relate to. 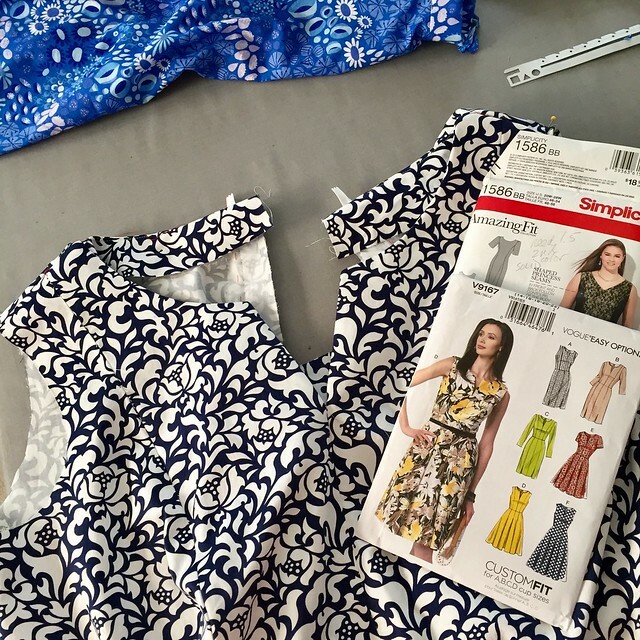 Fitting really is a challenge, and shows you how much goes into a sewing pattern. 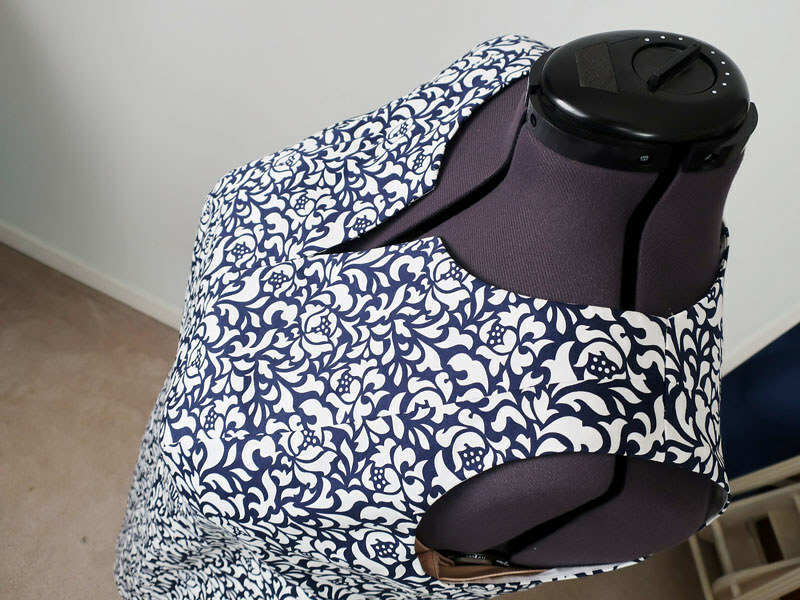 In the past few years I've expanded my knowledge of fitting so much, and I think sewing for other people lets you take a very critical look at fit without getting hung up on how a thing might look on you personally. Fortunately I have a my very own muse, in the person of my friend Heather. Now that I've been making things for her for more than 5 years we are at the point where I just pick out the patterns and styles, and she says yay or nay. But mostly yay. Or she will give me an idea of what she wants, or show me something on a website and then I find the pattern and/or adapt to create the look. Which I just did tonight for a simple silk blouse that will appear in the future. 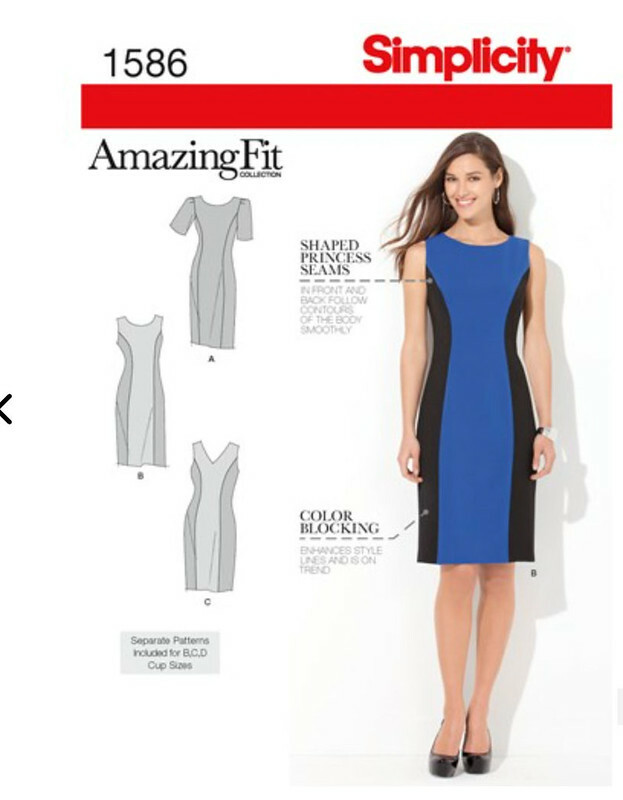 Today's item is a simple dress pattern that will make a lot of appearances in the future, as I'm so happy with the fit and a basic princess seamed sheath dress can be adapted to work in any season, with so many fabrics and with sleeve and neckline variations. 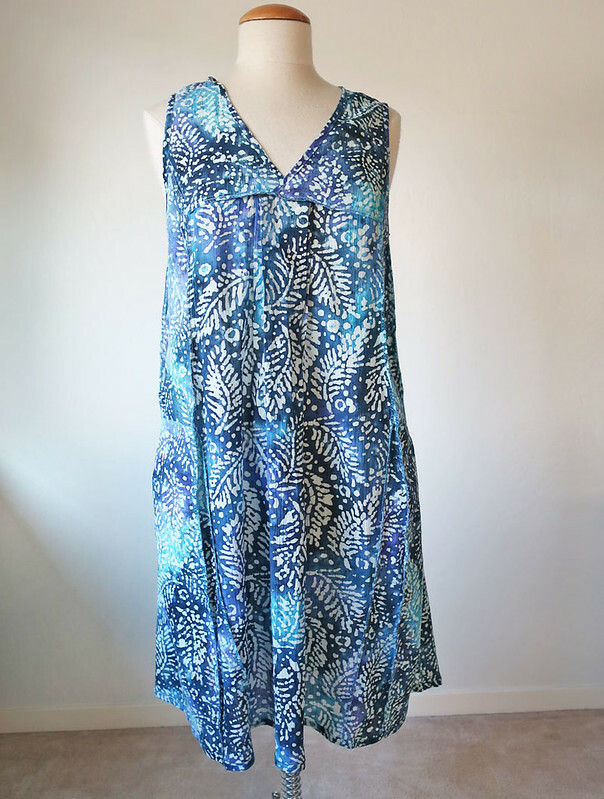 I saw this fabric on the Mood website and knew it would be perfect for a sleeveless summer dress. It's a cotton sateen with a touch of lycra. Here's the link, still in stock. It would make a cute summer jacket as well. It really is navy blue and white even if it looks black on the screen. But what about the neckline? Yes, you know I can't leave a pattern as it is, and also I was trying to go for the look of another pattern. See below, this Vogue 9167 which has shoulder princess seams and a center front seam which creates that V-notch neckline. Let's work backwards. 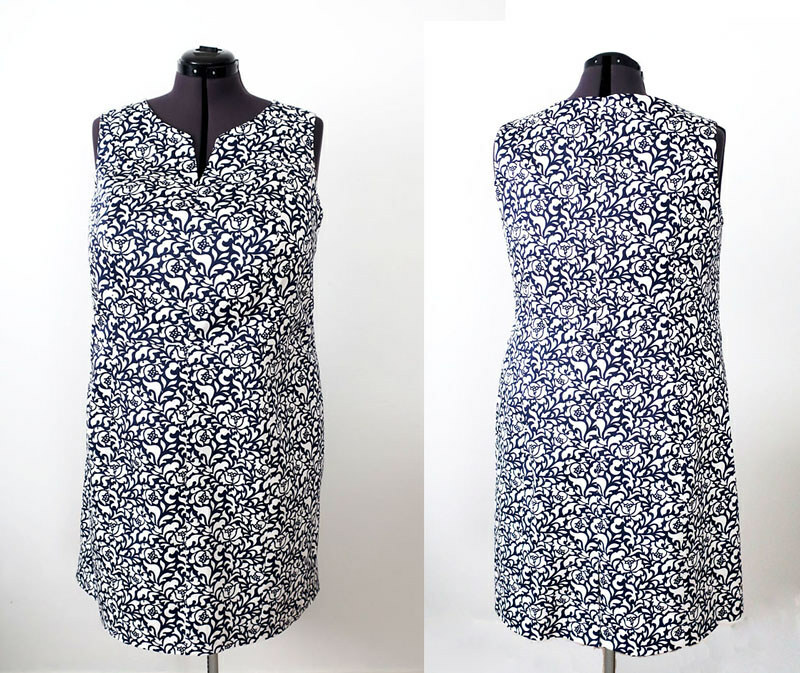 Since this fabric is such a busy print it's a bit hard to see the detailing of the dress. And I worked so hard to add the waist seam which totally disappeared!! Here is the dress inside out, before lining was added so you can see the seam lines. And here is the pattern that I used as the starting point. 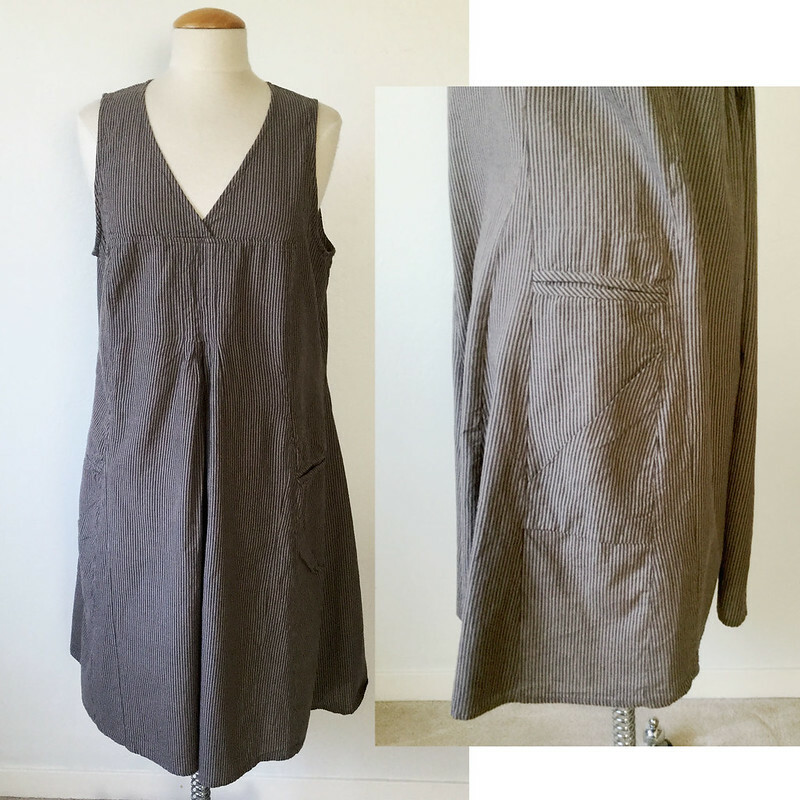 I made a dress for Heather earlier in the summer in a beautiful Loro Piana wool we bought at Britex, it's so nice and I can't seem to find the photos I took. For that dress I made the pattern as is, with the armhole princess seams. This is the pattern I used as the starting point. These Amazing Fit patterns are really useful. 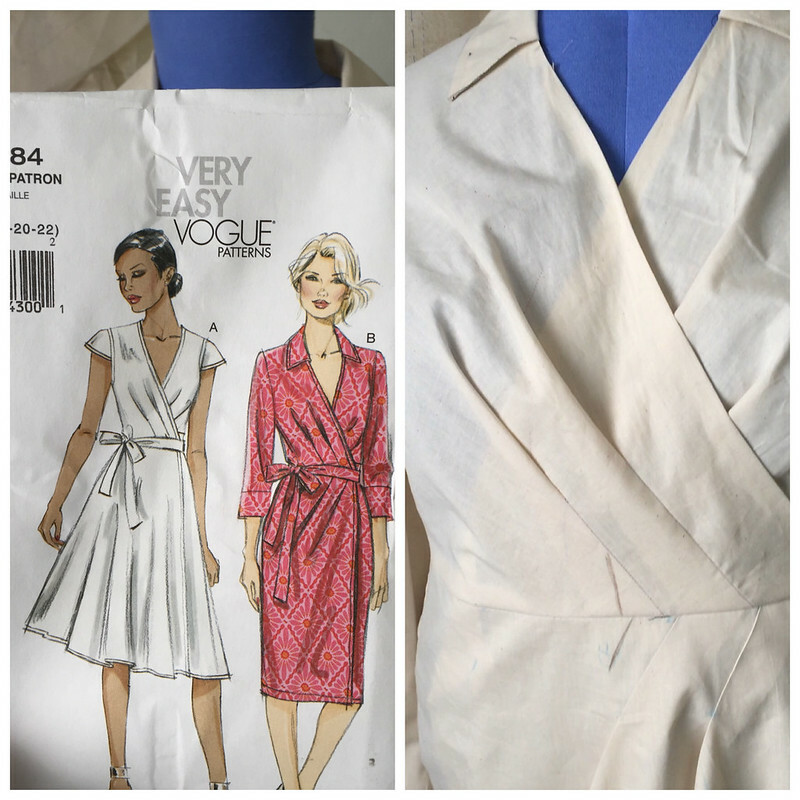 I know that some of these patterns from Simplicity and McCalls, Vogue etc get criticized for having excess ease - but they give you the final garment measurements on the envelope or on the pattern pieces. I try to teach in my classes to the multi-size to adjust as needed and get the amount of ease that you want. Although I tend to err on the side of more ease because I think most dresses (wovens) should kind of float around you instead of being really form fitting. It actually reduces wrinkling and drag lines. In order to have the style of the Vogue pattern (which I could have used but would have needed to start fitting for Heather from scratch) I made a pattern alteration on the Simplicity pattern pieces to have shoulder princess seams instead of the armhole princess seams. I'm pretty sure that somewhere in my photo stream are the photos of the work on this - as I made paper pieces with no seam allowances, pivoted the seams and then derived the new pieces. Another thing to look for in my giant file of photos ;( The white paper below are the new pattern pieces. Also I raised the armhole slightly, added a seam allowance on the center front instead of cutting on fold, and added the V-shape notch. 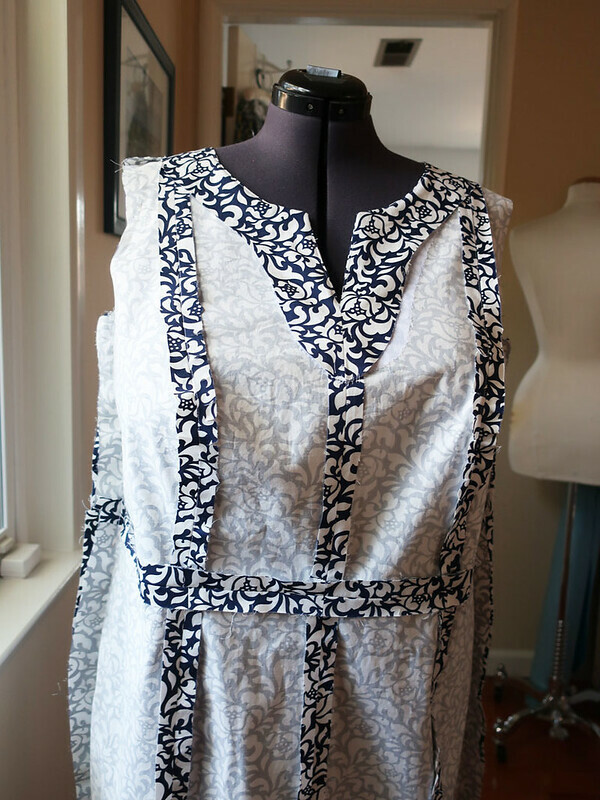 I also added more seam allowance at the shoulder just to be able to play with that on final fittings. The back is done similarly, actually a bit easier as it doesn't have the bust shaping. Here I'm cutting out the dress lining in plain white cotton batiste. 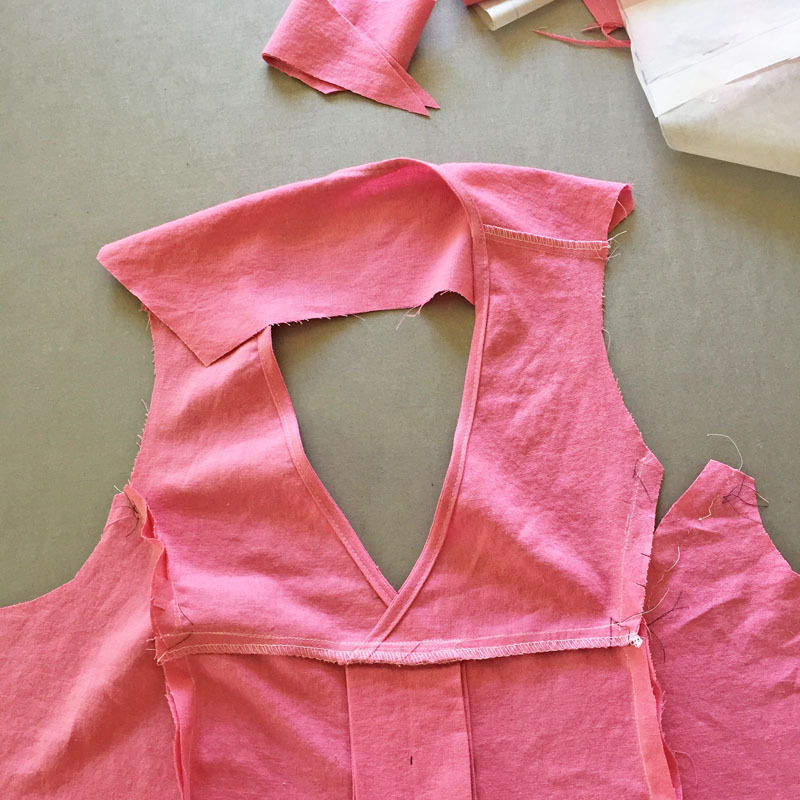 When I do these types of neckline or upper body adjustments I just make a half body pattern piece, and attach to the regular pattern piece since there is no need to remake the skirt portion. You can also see the front facing that I drew on the pattern piece and then traced onto the fabric. 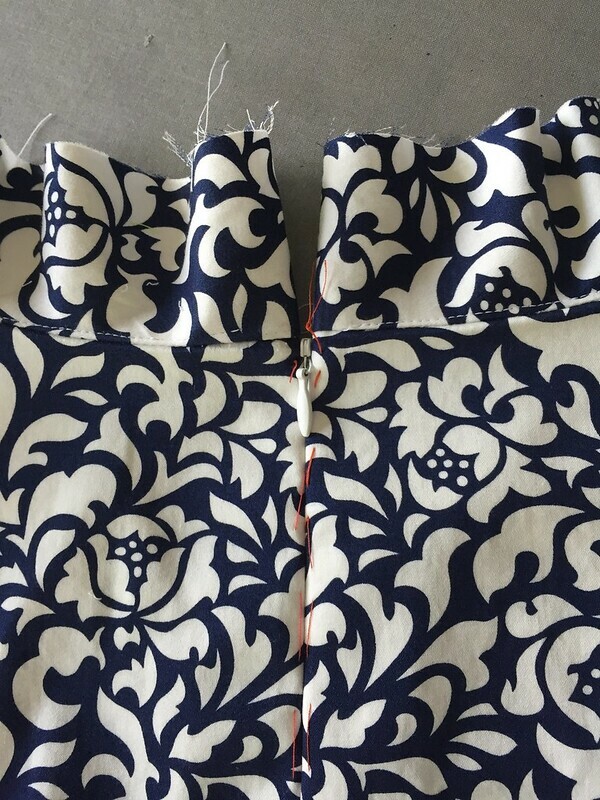 With these V-notch necklines it's important to have sufficient interfacing, I usually use fusible on the facings as well as sew some silk organza on the dress side. Then I sew on the facings and under stitch as far as possible on all seams. 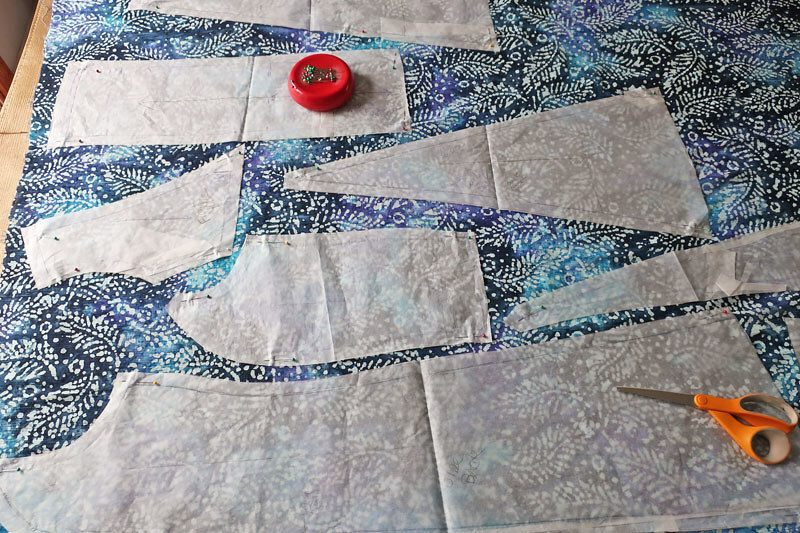 You can see that all that seaming gets lost in the print, but it did allow a very nice fit and this pattern will be so useful in either way for future dresses. I'm even thinking I can add a bit of ease and use it to create a top as well. Of course she doesn't plan to go barefoot but when she came over she was wearing jeans and sneakers so those shoes wouldn't quite go for taking pictures - plus we are still enjoying a bit of summer here. If you look closely in this picture you can see the red thread. I'm a bit thread tracer, I use a bright and contrasting thread to mark stitching lines on all kinds of garments. 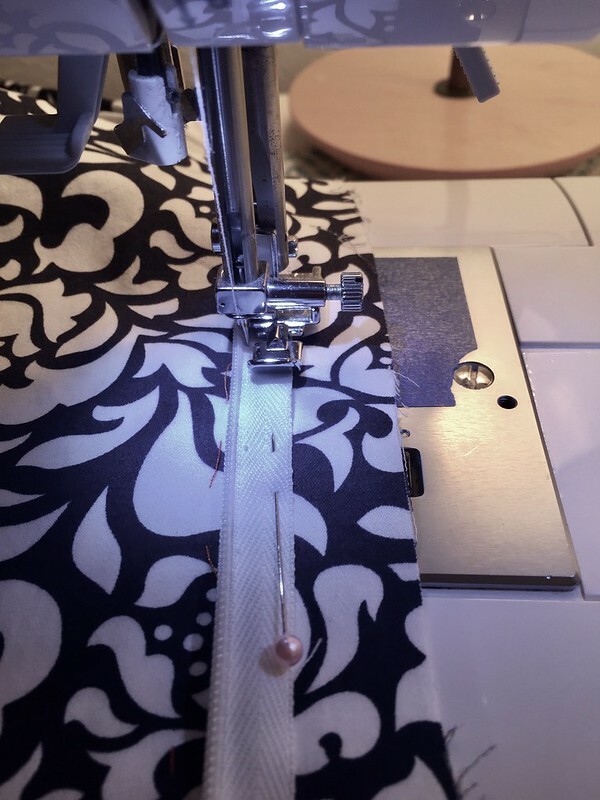 It takes a few minutes but it is just so stable - and you can mark where you are going to sew, or where you pin fit a garment and then set it aside knowing you can pick it up again without pins falling out or otherwise shifting. In fact you can then take apart what is pinned together and sew the pieces in the order you prefer, allowing for linings/facings etc to be put in as you go. Sometimes I construct the whole top of a dress, sleeves, lining etc and then add the skirt and skirt linings, and then zipper last. Anyway - this zipper came out really well. I always aim for perfection but there is good and then sometimes just right :). Note that I don't have an invisible zipper foot - I just use the regular zipper foot and move the needle as needed. (Although the sliding zipper foot on my vintage Singer machines is actually the best of all and I sometimes use that). Yes you are seeing that right, no serged seam allowances on this dress. I just don't like serged edges on a lined garments, all that thread bulk for what? But I think I might be in the minority with this opinion. All the notches and markings, how to you see them if you have serged all your fabric pieces? 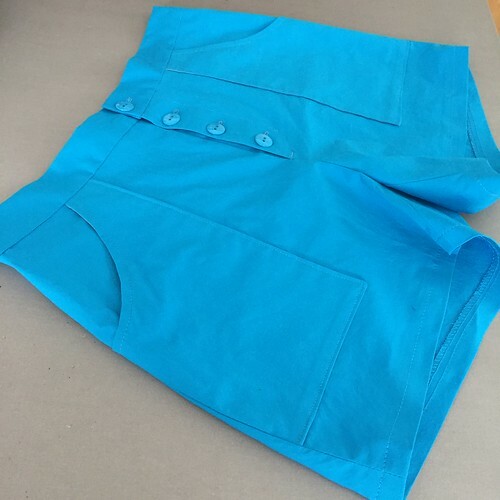 One other tiny fit adjustment was to sew on the lining at the back armhole with a very small seam allowance, which added about 3/8" just above the armhole. With tightening up the center upper back at the zipper that can take away at the outer edge. I like where the back armhole has landed but wouldn't want it any further in towards the center back. Conversely if it was further out I think it would look block-y. These tiny proportion adjustments are things I fuss over (and drive myself a bit crazy) but I think they make such a difference in the finished garment. Things you don't notice but give an overall impression of nice fit and proportion. One more weird photo because I took it and it shows the neckline. So that's the latest on this dress. Expect to see this pattern again with variations in design and fabric. 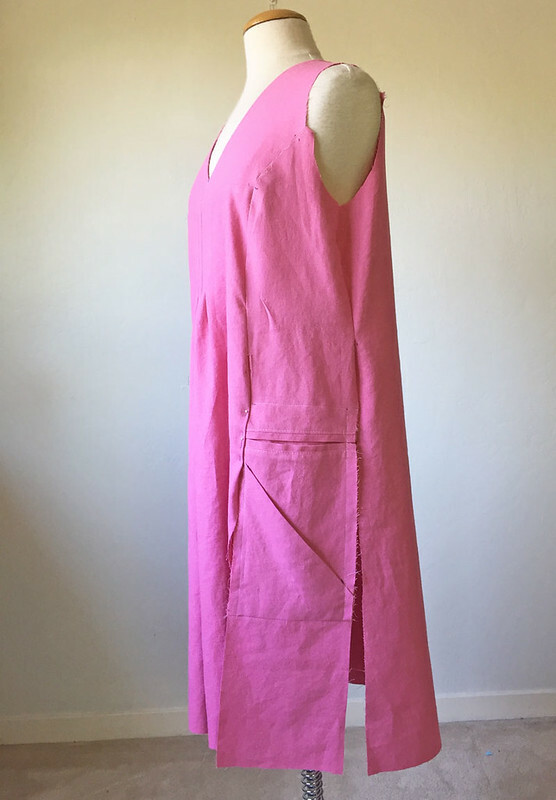 I just made a test garment for a completely different dress for Heather, a wrap dress and this one, after a fair bit of work is going to be fantastic. Vogue 8784 I'm making the slim skirt long sleeve version in a printed silk. So Simplicity Amazing Fit patterns, I frequently recommend. And it drives me crazy that they have discontinued so many - thank goodness for eBay where I have been buying so many recent patterns. 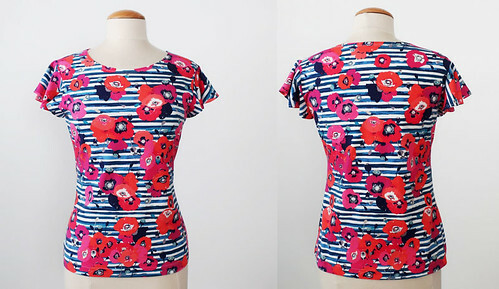 Up next, I'm sewing a shirt for myself in another Mood fabric, a silk/cotton Liberty voile. And then it's on to jacket sewing - my class is coming up in early November at Hello Stitch in Berkeley. It's a weekend workshop, with lunches included. I wrote about all my upcoming classes in this post if you want to check that out. We've added some more in the schedule since I wrote that so you can look at the Hello Stitch website for all the latest. Including a Fit Lab Pattern Fitting class on Oct. 14 which wasn't originally on the calendar but we have added - so you could fit your jacket or coat then. Today's garden photo, more of the dahlias. This one I bought at the junior college horticulture department May sale. 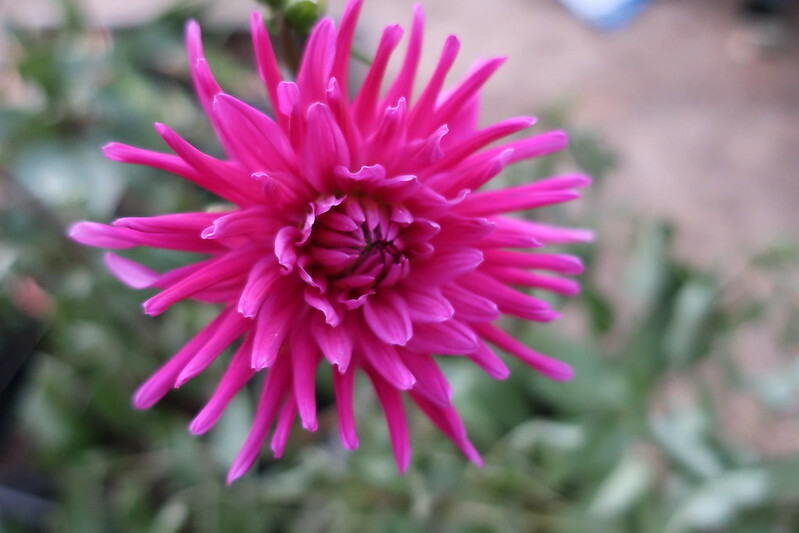 Typically I like the dahlias with lots of petals but this is so cute and it's been a great bloomer. So far I'm keeping with my declaration made in my last post - no more dresses! at least for a little while. The end of summer and turn to fall fashion is always conducive to making separates. After all, a nice wool jacket is my favorite thing to sew. But we still have summery weather here and I had a few fabrics that wouldn't wait. So here's what I've been sewing recently. I bought this fabric earlier this summer, with a Stone Mountain Fabrics gift card given to me at Christmastime by the lovely owners of Hello Stitch. Yep I am a bit slow when it comes to using gift cards. Because I want to buy something special, and then remember the giver whenever I use the item. There are some shadows in this photo so you can't see the full extent of those lovely blues. Someone asked on Instagram what pattern I used. It is an out of print New Look pattern, although as usual I have shaped the armholes to be a bit cut-in as I just prefer that shape. Here's the pattern. It's maybe 10 years old? 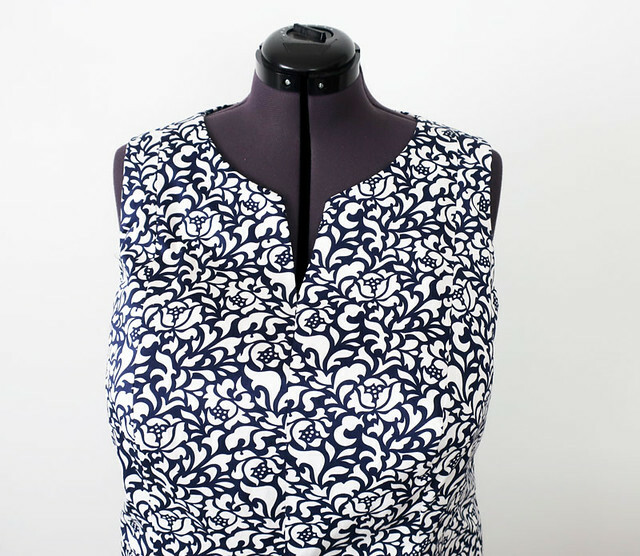 I have used it so many times, first in eyelet for my friend Alice (who actually gave me this pattern), and then long sleeve version (love and wear to excess) and then more sleeveless versions one and two. and now another one. The fabric is a cotton voile or lawn? It is just a tiny bit more firm than I would like, I prefer these fabrics to be really floaty but maybe with more washings it will soften up. I did prewash once. 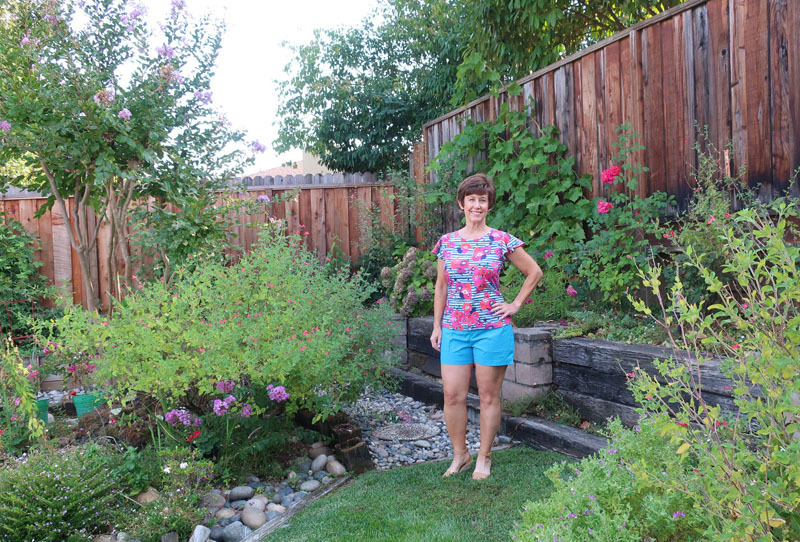 Don't look too closely at the garden - getting to the dry and crispy end of summer here in California and we are all just holding our breath until the rain starts again. I decided to lean into the very feminine look of this and add the ruffle sleeves. Turns out I really like them and plan to add them as a shoulder ruffle to a long sleeve t-shirt. Close up view of the fabric and neckline. This is just a turn and stitch neckline, which I'm not really a fan of, but if you choose the right fabric it works out very well. The pattern is McCalls 7538, which has all kinds of diagonal piecing. That I removed when I made this sequin t-shirt and that has left me with a perfect fitting plain t-shirt. 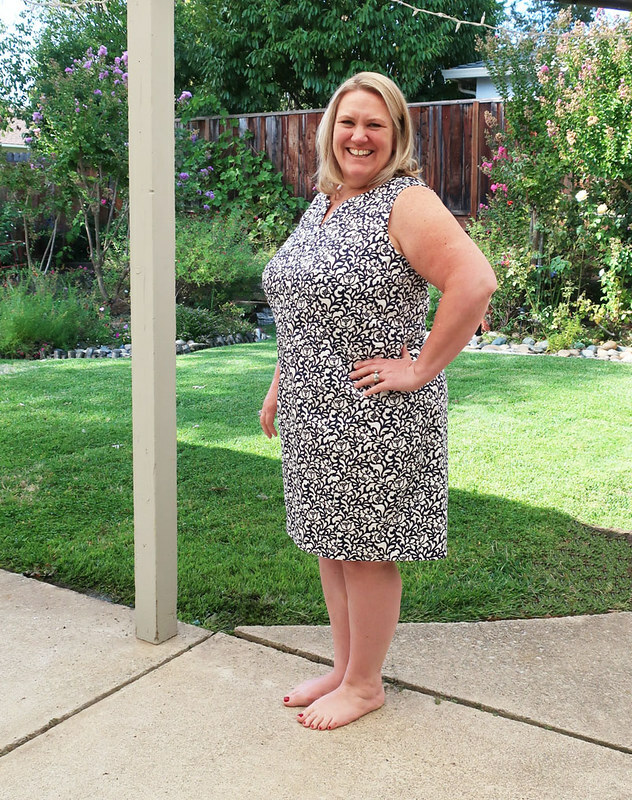 For the ruffle sleeves I used the pattern piece from this McCalls knit wrap dress. And the top sort of matches - or maybe goes with - the Lander shorts I made as a practice run before teaching my Lander pants class last Saturday. Which was a great class and a great group. So popular we have scheduled another session on Sunday Oct. 7. I believe that upcoming session is halfway to sold out so if you are interested sign up soon, here's the link. 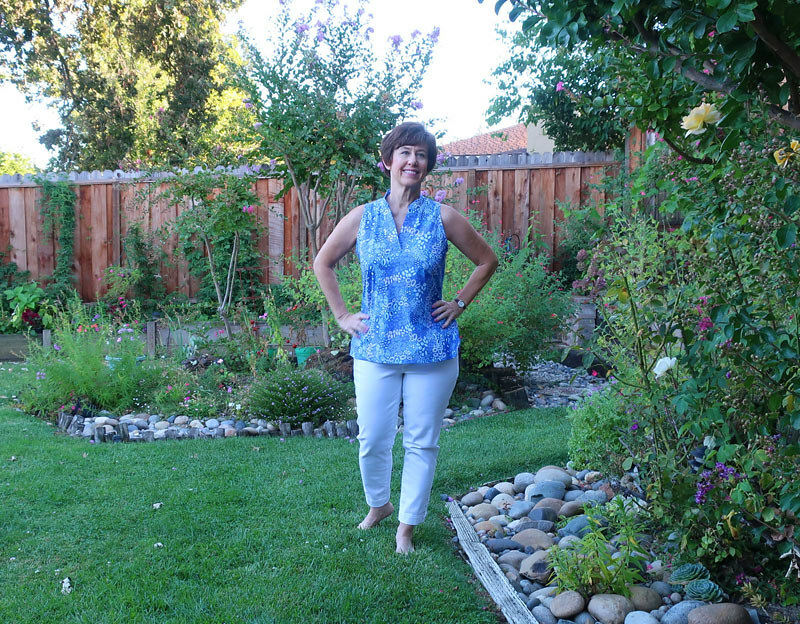 As pants go these are easy to sew, and the fit seems quite forgiving. We have a few test versions stitched up at the studio for students to try on and see which size they might start with. So that's what I've sewn for myself lately. I have all kinds of ideas and plans swimming around in my brain for fall sewing, including this jacket from Burda that completely unnecessary in my wardrobe but so pretty! 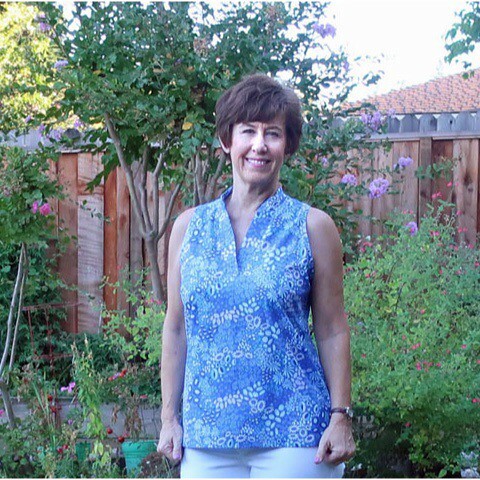 Upcoming classes: at Hello Stitch Studio in Berkeley. Sept. 29: Wrap Dress class. The last one was really popular so we found a spot on the calendar for another one. Perhaps your special holiday dress?? 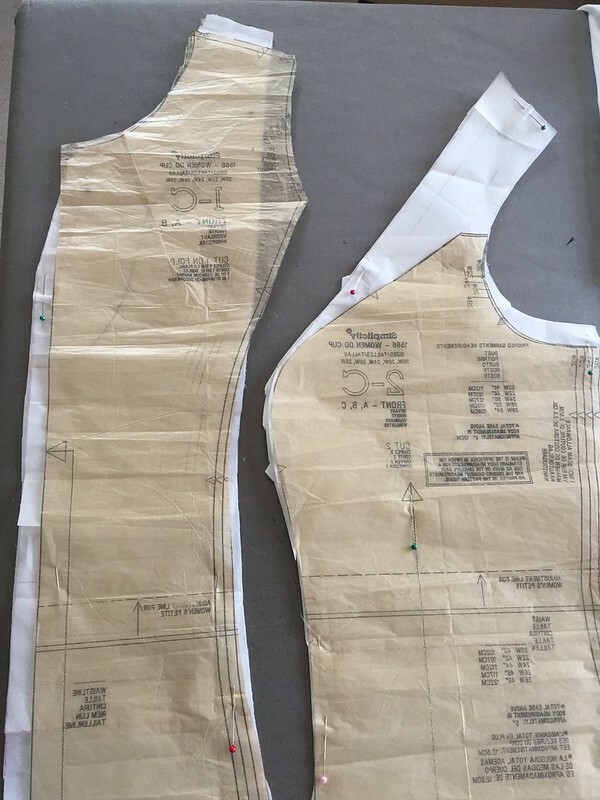 Nov. 3-4: Jacket/Coat Tailoring, weekend 2-day workshop. Lots of demo on all things jackets, such as sleeve sewing, buttonholes, welt pockets. 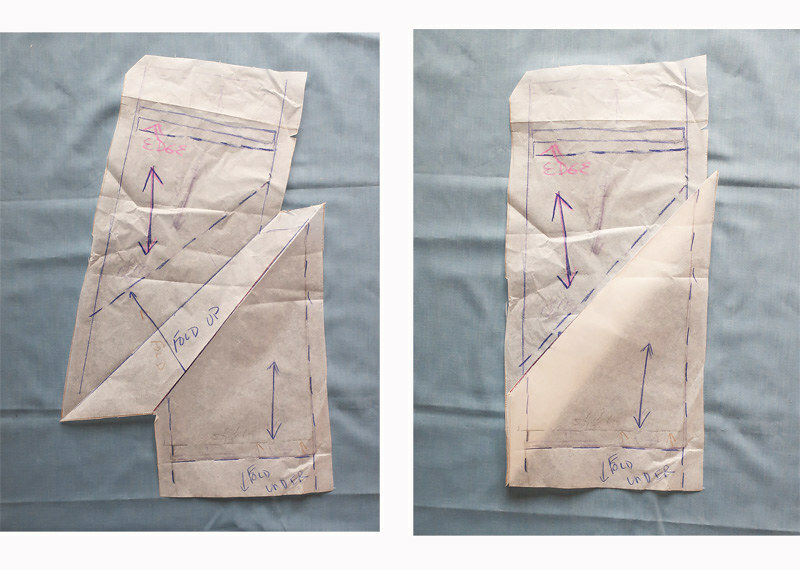 how/which/where to use interfacing, linings etc. 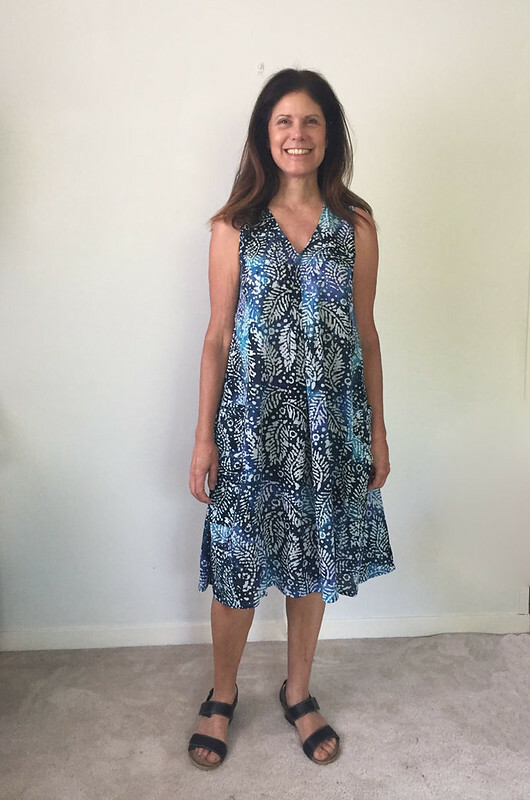 I just finished a super cute dress for my friend Heather, and changed the pattern from armhole princess seams to shoulder princess plus some other interesting adjustments so a blog post on that one soon. 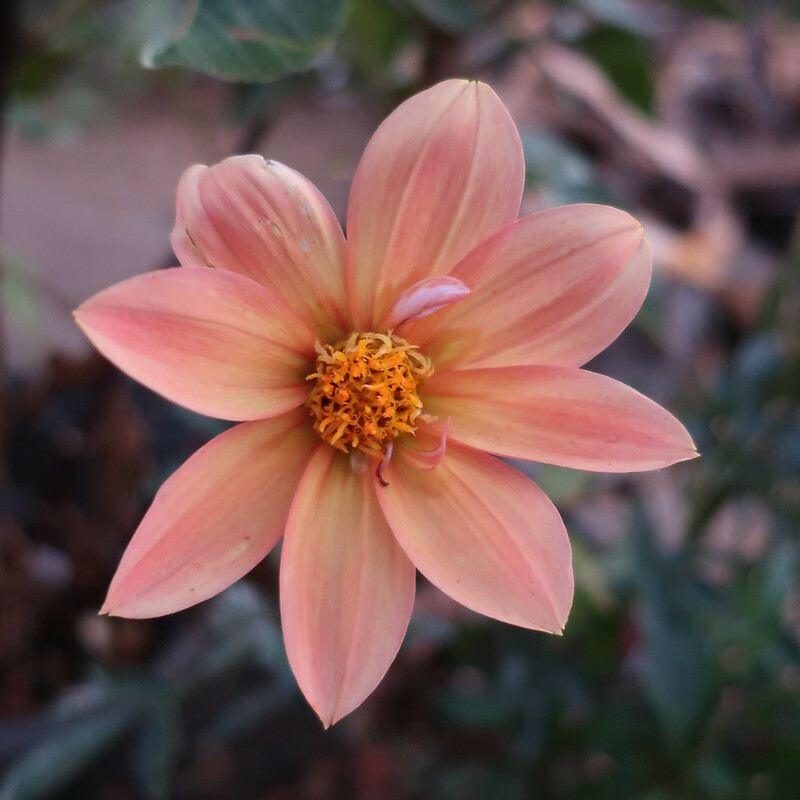 Todays garden photo, this time of year I'm trying to get as many blooms as I can from the dahlias.